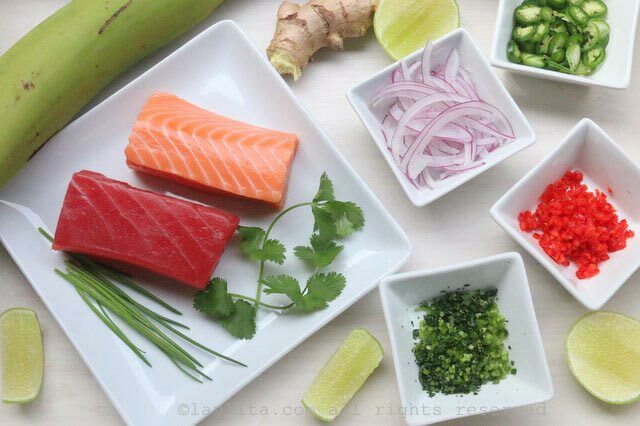 This salmon and tuna ceviche recipe is inspired by the flavors of poke. 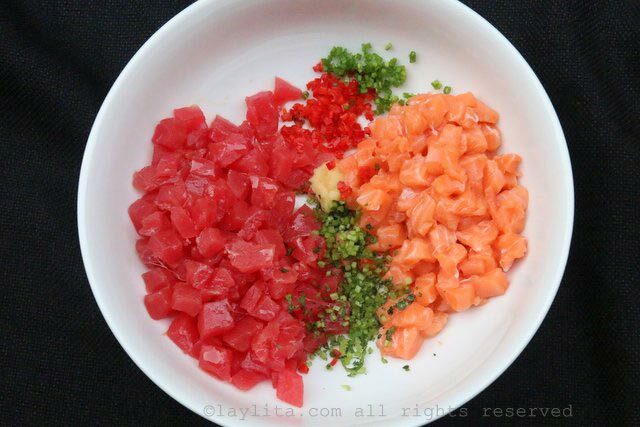 Poke is a Hawaiian crudo style salad made with raw tuna, onions, soy sauce, and other condiments/spices. I love tuna poke and discovered it when I moved to the Pacific Northwest. I’ve wanted to make a ceviche style take on poke for a while now. 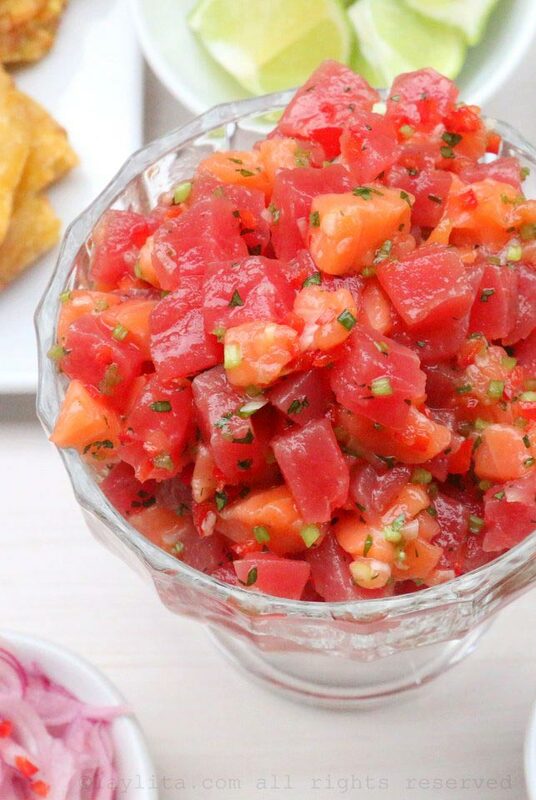 This salmon and tuna poke inspired ceviche is made with fresh sashimi grade wild salmon and tuna marinated with soy sauce, ginger, chili pepper, avocado oil, sesame oil, and chives. 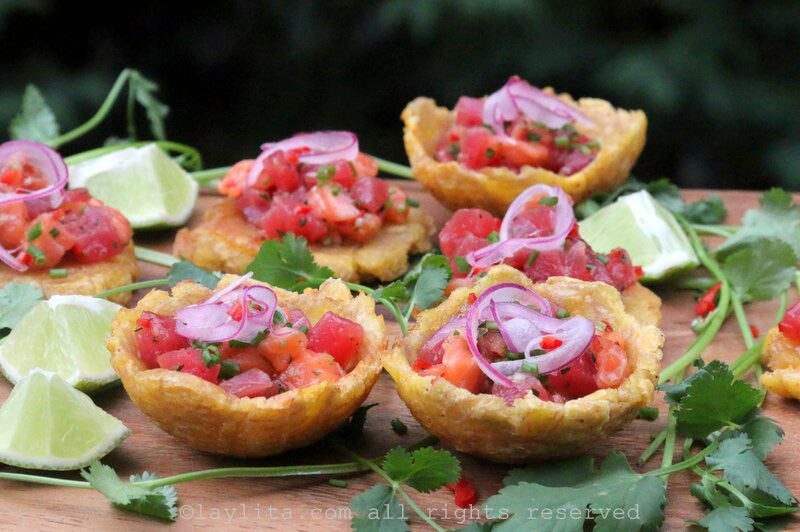 It is drizzled with lime juice right before or when served, topped with lime marinated red onions, cilantro leaves, and served on top of traditional patacones/tostones plantain chips or in patacones shaped as small cups. 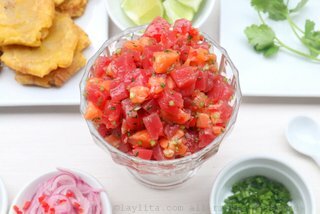 Recipe for salmon and tuna poke inspired ceviche marinated with soy sauce, ginger, chili pepper, avocado oil, sesame oil, and chives. 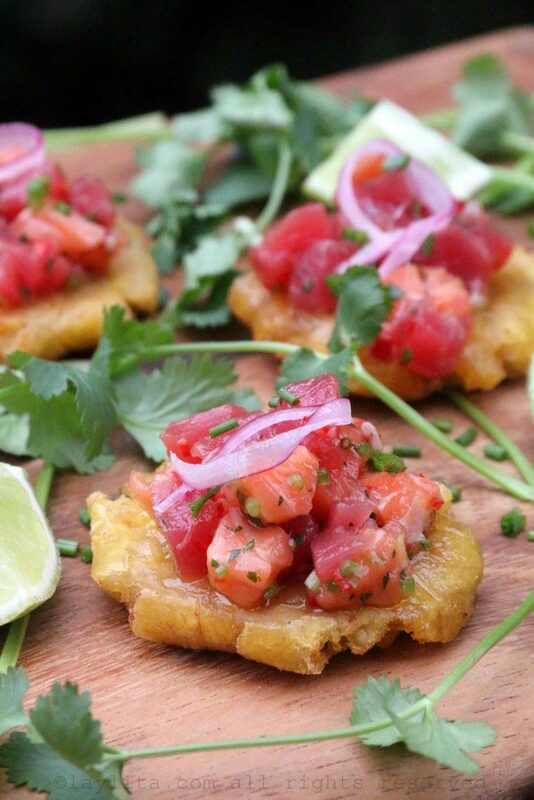 Drizzled with lime juice, pickled onions, cilantro, and served on green plantain chips. 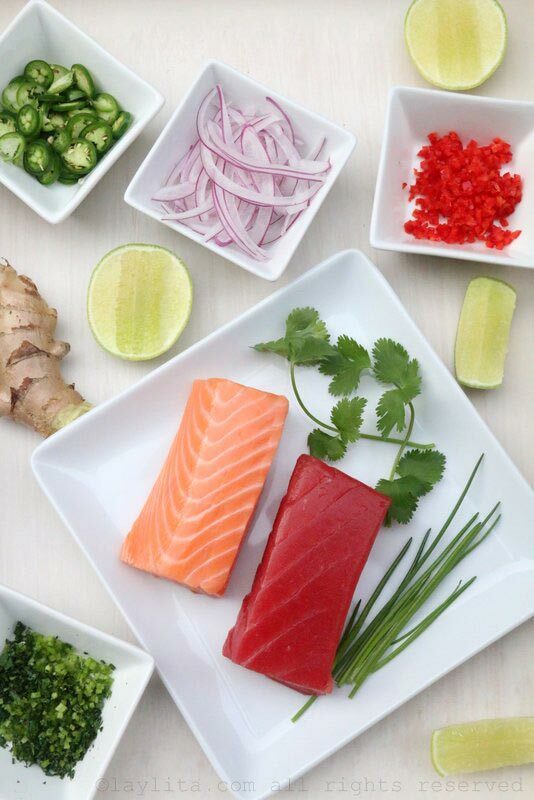 In a small ceramic or glass bowl, combine the salmon and tuna with the avocado oil and sesame oil, mix gently until the fish is coated with the oil – this will prevent it from oxidizing. Add the chives, ginger, hot pepper, and soy sauce. Mix well, cover and refrigerate for at least 30 minutes or until ready to serve. 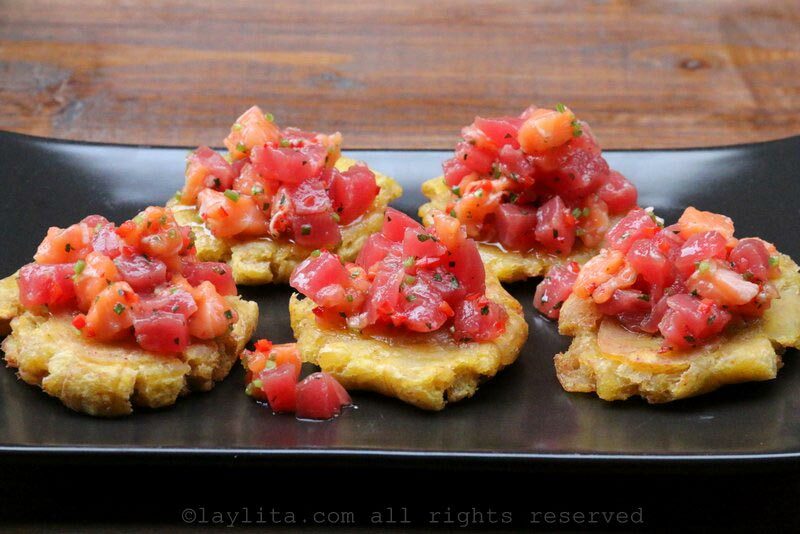 While the poke ceviche is marinating, prepare the patacones or tostones. 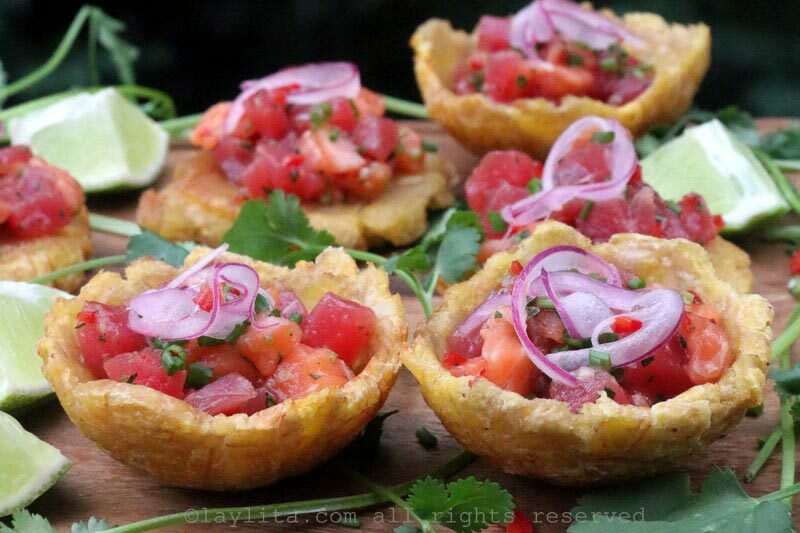 They can be made the traditional way or you can form them into a round mini cup/bowl form to be filled with the ceviche. 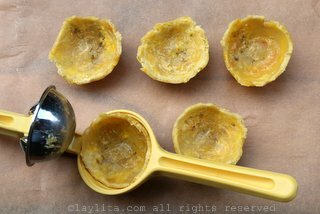 To shape them into a round cup shape, place the plantain chip after the first frying, into a lemon/citrus squeezer and gently press it, then remove it very gently, and fry it again as you would with the regular patacones. 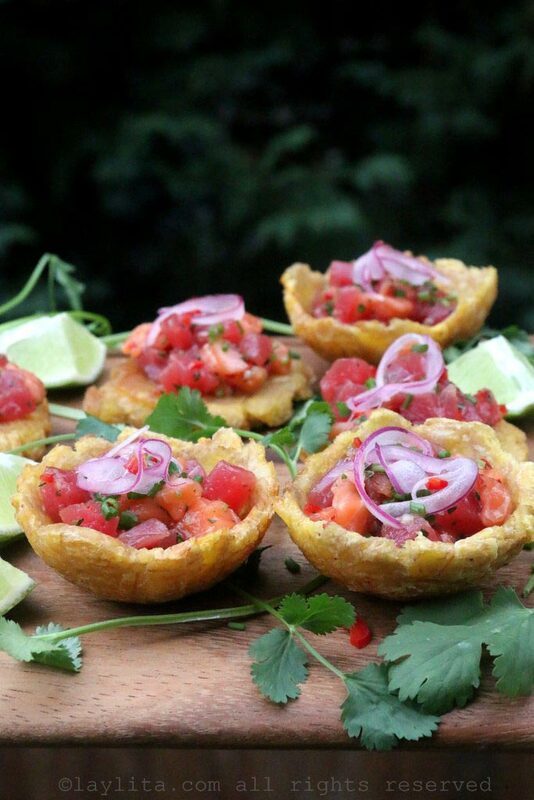 Serve the salmon and tuna poke inspired ceviche on top of the plantain chips or inside the plantain cups. Top with a drizzle of lime juice, the pickled red onions, cilantro leaves, hot sauce to taste, and any other garnishes you prefer. A few months ago, my friend Pilar, from the blog Confieso que Cocino, was visiting Seattle and we spent the day cooking. We prepared a couple of dishes, including a delicious shrimp and corn chowder locro soup. A trip to the local Asian supermarket Uwajimaya (one of my favorite places in case I haven’t already mentioned that a million times), inspired us to make this salmon and tuna poke style ceviche. 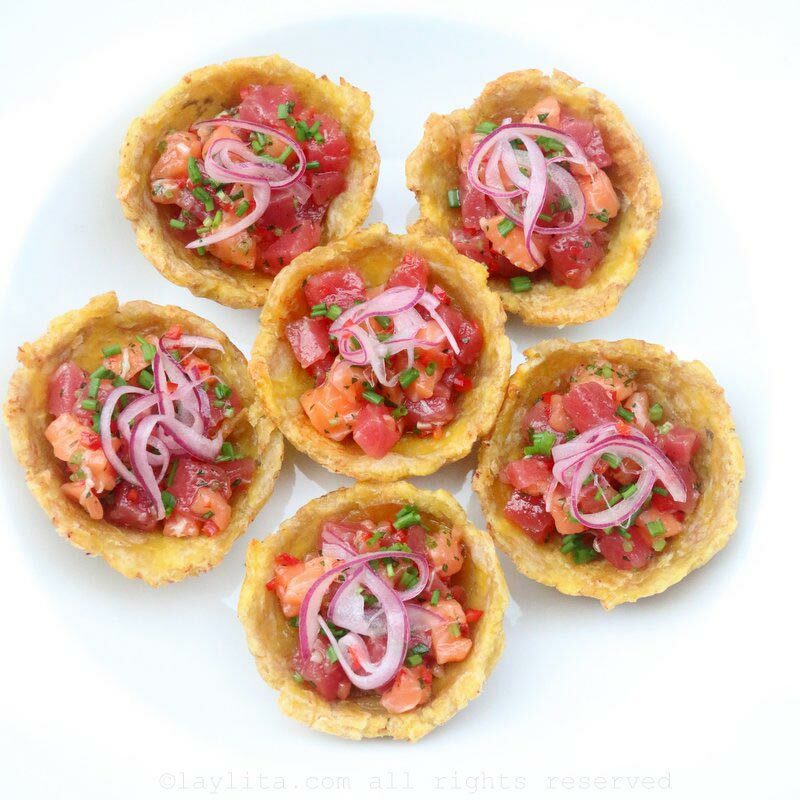 We wanted to make a dish that had elements of Seattle, including the Asian influence that you find the local food, and the dish also needed a Latin/Ecuadorian touch. 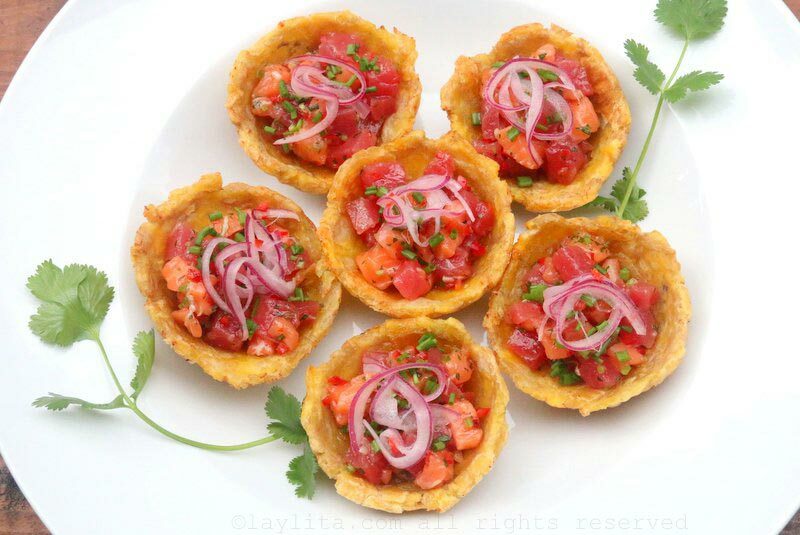 A traditional ceviche is usually made by marinating the fish in lime or citrus juice. 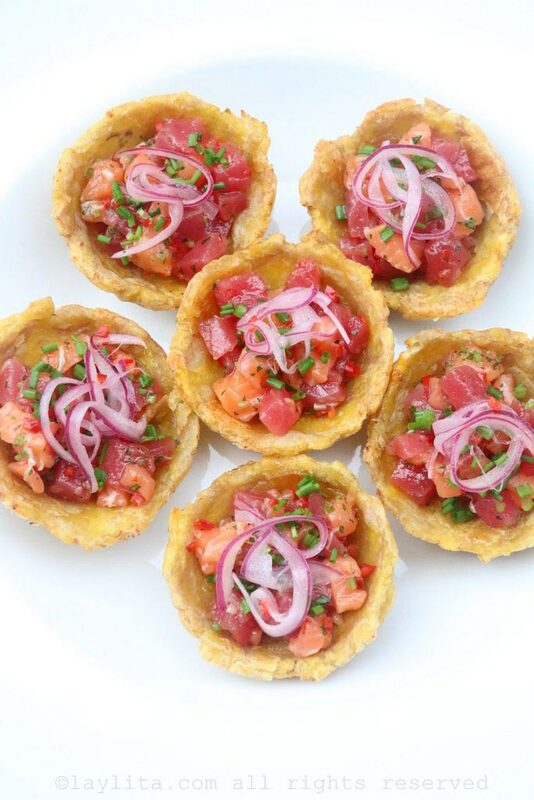 For this poke style ceviche, we wanted to preserve the beautiful vibrant colors of the tuna and salmon, so we added the lime juice and pickled onions right at the end. If you prefer a more intense lime flavor, then you can add some lime juice and sliced onions to the poke ceviche while it is marinating. This is my second time making this and it is absolutely amazing! Thank you so much for the recipe! 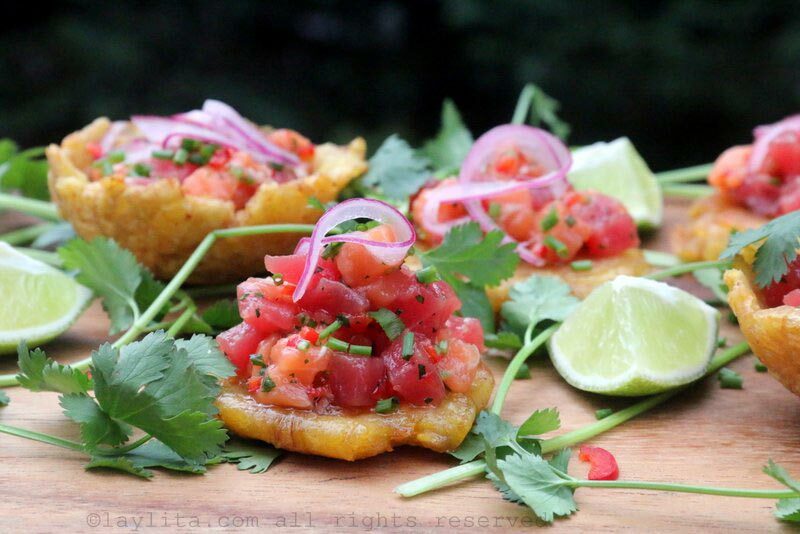 My mouth is watering…yum. I want to make this…right now! Thanks for all the great recipes and pics. Looks yummy, sure it tastes great. Gonna try it soon..
Lov all ur recipes……Thanks much!